During a hot tub party at my place at The Resort At Squaw Creek, I got to know a fellow owner who retired five years ago as a partner from a major law firm. We got to talking about the roller coaster ride we’ve had since purchasing our vacation properties 10 and 9 years ago, respectively. He told me something surprising after I asked him somewhat jokingly what he plans to do with his property now that global warming was over. After all, Lake Tahoe got a record ~23 feet of snow in #Janburied 2017! When I bought my vacation property in 2007, the purchase price was equal to roughly 25% of my net worth. Today, using the same purchase price, my vacation property is worth less than 8% of my net worth. Fast forward 10 years in the future, my Lake Tahoe property will account for less than 5% of my net worth if my net worth grows by a modest 4% per year. And by the time I’m 60 years old in 20 years like the law partner, the property will be worth just <3.5% of my net worth AND completely paid off. Any asset that’s worth less than 10% of your total net worth starts feeling like a relatively insignificant amount of money. Think about it. Your 10% asset could lose 100% of its value, and you’d still have 90% of your net worth intact. Hence, my 1/10th rule for car buying has been a popular guideline because it helps protect consumers from their spendy selves. I so happened to spend a significant 25% of my net worth on my Lake Tahoe vacation property right before Financial Armageddon hit. But if I had spent just 10% of my net worth on the property, I probably never would have started Financial Samurai in 2009 because there wouldn’t have been enough pain. Ah, thank goodness for always having a positive mindset! This is actually a road buried in 23 feet of snow. 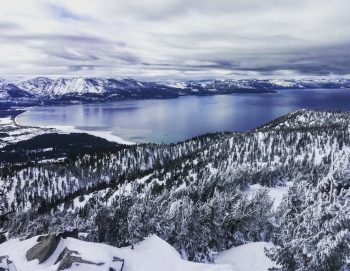 January 2017 Lake Tahoe. What the ex-law partner said about passing his property down to his children really spoke to me since I’m planning to have a family of my own soon. Given his daughters are now 26 and 28, and he bought his condo 10 years ago, he lamented that he never got to spend as much quality time up in Tahoe with his family as he hoped. As teenagers, his daughters wanted to hang out with their friends somewhere else instead. Since first coming up to Squaw in 2001, I’ve always imagined it to be a place where I could take my kids during their school holidays. During summer vacation, we can go hiking, mountain biking, boating, river rafting, kayaking, and water skiing. During winter break, we can go sledding after seeing who made the best snow angels. Lake Tahoe is magical. Of course, not everything goes according to plan, but I’m someone who has the patience to think in 10-year increments. After all, I spent 11 years at my last firm and I’ve consistently written on Financial Samurai for eight years so far. Further, I’m now a varsity boys tennis coach because I want to see what it’s like working with teenagers at least 14 years before having one of my own! Perhaps through this new job, I can figure out a better way to relate to my future teenager so he will want to spend time with his old man. The value of my vacation property will personally skyrocket if I’m able to fulfill my vision of hanging out with my little one up at The Resort. Neither he nor I would have a care in the world. When he grows up to be a big boy, he and his old man can carve down the leisurely blue run and talk our own stories as we soak our aching muscles in the outdoor hot tub. Hopes and dreams are what keep me going. 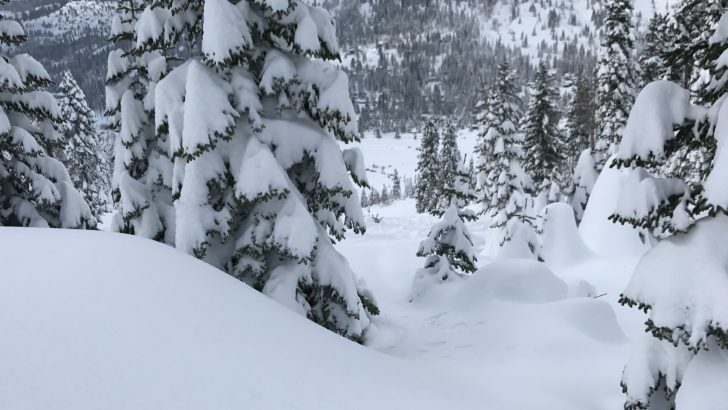 Just imagine skiing/boarding through this fluffy powder on Monday, January 23, 2017. If you can view your vacation property as an investment in lifestyle instead of as a financial investment, you’ll find your asset much more rewarding. In order to never have your vacation property feel like a burden, I suggest spending no more than 10% – 20% of your net worth on a vacation property purchase price (not downpayment). I feel so much better now that my vacation property is worth less than 10% of my net worth versus when it was 25% of my net worth. If you foresee a rapid increase in your income and net worth, then you can probably stretch your vacation home budget to 25% of your net worth. But I don’t recommend doing so based on all the worry and stress I had to go through. Buying a vacation property for enjoyment and then constantly worrying about whether it will financially ruin you is counterproductive. Finally, before buying a vacation property, make sure you calculate how much you’ll actually be able to use the vacation property a year. Run a cost of ownership comparison to the cost of simply renting a nice place anywhere you want. Overestimating the usage time is quite common. The reality is that most people can only take off at most 4 – 6 weeks a year. Only if you’re unemployed, financially independent, or have a location independent business can you truly maximize your vacation property. It’s been an amazing financial run since 2009. I’m sure some of you are far richer at this point in life than you could have ever imagined. Just make sure you never confuse brains with a bull market. Continue to maintain the financial discipline that got you here in the first place! Invest In Real Estate Across The Country: Owning a vacation property is more a lifestyle choice and less of a good investment choice. If you want to make money in real estate, take a look at Fundrise, one of the largest real estate crowdfunding platforms that has investment opportunities all around the country. I foresee crowdfunding to attract a lot of capital to lower valuation, higher yielding projects around the country. Minimums are as low as $1,000, and you can invest in commercial real estate once available only to institutional investors are the extremely rich. I personally have $810,000 in real estate crowdfunding in markets outside of expensive San Francisco, Honolulu, and New York City. Update for 2019 and beyond. I’m finally getting to take my little boy up to play in the snow after 10 years of waiting! I can’t wait. I don’t care about the financial performance of my vacation property at all now because it accounts for less than 5% of my net worth. A vacation property really is all about lifestyle. What is everyone’s thoughts on a vacation house if you are not having children? We are considering a cabin about an hour away near a lake, we would put probably 40% down on the property. All our other friends are having kids, which will probably cost them more than the cost of this cabin. It’s either get a vacation house, or trade up to a bigger, more expensive house… Tough decision! We don’t have kids, aren’t planning to have any, and just got approved for a mortgage on a vacation home yesterday (40% down as well). Our current home is 1500 sq ft and I sometimes wish it were bigger but I don’t think an extra couple of rooms would add much to our life – other than provide storage space for more stuff we don’t really need. Whereas getting out of the city and looking over fields and trees will certainly reduce stress in addition to bringing in a modest income if we rent it out a few weeks a year. I have kids aged 8, 6, and 1. The two older kids are on a ski team and we go almost every weekend. Over the years we have made friends with many regulars. After training for the day, the “neighborhood kids” would play outside while the dads and moms pop a beer. The memories being created are priceless. However I disagree with buying vacation properties. They rarely work out as investments. I almost bought 3 years ago but the internal IRR was in mid single digits assuming modest capital appreciation, and it would have been cash flow negative. That property would have only been <3% of our NW but the cash flow aspect made it a non starter for me. I have done ski leases for the past 4 seasons. Last season the heat broke down for two weekends in a row. Eventually the property manager overnighted a part to Reno, had her maintenance man drove to Reno and back in a snow storm, to install the part. I had no idea how much it cost the owner, but I sure was glad that it wasn't my problem. This season we decided to split a nice big house with 3 other families, 10 kids total. It's an absolute mad house in the morning and evenings, but every single family agreed that this was a good idea, again for the memories being created. If I had bought and got locked down, we would not be able to do this. I do own a ton of time shares, specifically Disney. There is an active secondary market both for buy/sell and rentals. I can get cash on cash yield of mid teens if I don't use them myself. This is a good market for sophisticated investors – you have got uninformed sellers (often bought because of high pressure tactics), and a supply / demand imbalance (buyer usually dictate price). If you have kids it's great to have a timeshare. Hi – we’re in the market for a holiday home in Italy so the guidelines in this post are timely and a great reference for thinking about the purchase. We’re looking at places for about 20% NW and are probably 7yrs away from FI. Reason for doing it now is wanting to lock in a 20y fixed mortgage while rates are still low and also make a down payment while the Euro is weak. We’re under no illusions about how little use we’ll make of it in the next 5yrs but renting it out should cover a good portion of costs. Doing it while still working is reassuring, if things don’t go to plan we just work an extra year. Could you please do the same chart as above (with what your income or net worth should be before buying your first property)? And how much property you’d recommend buying? I know you’re a huge advocate of saving, but you’re also very pro-housing, so I’d be curious to see what you’d recommend. I’m starting to build my 401k to reasonable levels and my income is finally over triple digits, but I can’t bring myself to buy. So the crown jewel of our budding little empire is the family cottage ‘up north’, as we say around these parts. The cottage was originally bought by my wife’s grandparents in the 1950’s for $6,500. The cottage sits on 50 feet of Crystal Lake waterfront. This lake is 3 miles by 10 miles, spring fed, sand bottom and all around awesome. Four generations of our friends and family have been visiting the cottage as a home away from home, but like most lake houses, the cycles of death and inheritance had taken their toll. Certain families members, aka the Dura sisters, caused the house to be put up for sale several years before I was really in a position to make a play for it. But, as fate would have it, this was also 2008 and the economy collapsed. Seems nobody was in the mood for a second home. This downturn lasted until 2012 when my wife and I decided to make a plan and try to will ourselves into sole ownership. We took out a mortgage and paid the aunts off. After consolidating the cottage, we put $58,000 into it to really bring it up to date and started making it available on VRBO. The cottage nowadays almost pays for itself ($24k out/$21k in per year). We plan on retiring here and hoping that our kids will continue the tradition long after we are gone. Sam – What about, instead of a different rule for each purchase, having one overall rule for ALL non-financial assets? That would allow more flexibility for people to hold whatever non-financial asset appeals to them the most. I might want a nicer house, but my friends may prefer nicer cars, fancier watches, art, a vacation home, or something else. It’s something I’ve thought about off & on for over 10 years. Personally I decided not to go over 20% total (currently at 13%). My parents bought a summer home in Cape may, NJ in 1998. They refused to rent it out although even a week in peak summer can get them $8-10k. As part of my future inheritance, I might keep that tradition alive. Not everything is about money! Cape may is great! Too bad it is too far from north jersey / nyc to get there super easy every weekend. Sam, do you rent out your property to others or do you keep it strictly for your own personal use? Sam, I can say with much certainty that most vacation properties rock. We’ve owned several vacation homes over the years. We’ve also owned many increasingly nicer primary homes over the years, and by comparison, the vacation property was much closer to what we envisioned it would be like. For vacation property, it really boils down to spending quality time with family. Our kids are grown and out of the nest now. Some of our best memories as a family occurred at our vacation properties. 2. Vacation property has a better chance of living up to dreams and expectations. 3. Thinking about how fulfilling (and occasionally how difficult) life will be with children rarely compares to how truly amazing it actually is. What beats the memory of skiing down that black diamond ski run under perfect snow conditions alongside your son or daughter? For 2 years ending recently, I had a job in South Florida. They relocated me there and therefore paid the closing costs I incurred to buy my house with pool), which was a short sale. I fixed it up, and considered myself fortunate that my regular house was also a vacation home, and I had a job. But my boss retired. They gave me a choice to move under a relocation package, or lose my job. I struggled a lot about whether to move or not, and if so, whether to rent or sell. I finally decided to sell since they were covering all the closing costs. Made about $30k with owning the house only two years. But I miss the house dearly. And company never provided the career advancement they hinted would happen if I moved. My family thought my uncle was crazy when he paid $100,000 for a house on Rubicon Bay in 1976. Today the buoy for his boat is worth more than that. I loved spending 2 to 3 weeks there in the summer water skiing. So enjoy your Tahoe home and know your kids are sitting on a gold mine. I own a lakefront cottage and it is now worth 15% of my net worth. My parents got a vacation place when I was around 5. It is actually where my grandparents took my dad & his brothers when they were kids. My mom just got the foundation leveled, but it’s always been a little uneven. It’s not winterized so it’s only open May-Mid Oct. My mom stayed at home with us so we would spend the first 5 weeks out of school up there. Dad would come up on weekends and at least 1 week. Friends and relatives would rent out her cabins on the property around 4th of July so we have a lot of great memories! Then my parents would rent it out the other weeks of summer and make $ to cover maintenance and any bills. We’d use it some weekends spring and fall. Early on it only had a propane heater and the one time we woke up on an unexpectedly chilly day mom hand stitched some spare fabric into hats for us. Good post. You hit the nail on the head when you said it is about lifestyle. And your point about percent of networth ensures that having the second home lifestyle doesn’t become an albatross. You also touched on something I experience myself as the definitely 1% like problem of feeling I don’t see as much of the world as I would if I didn’t have a second home. Can you do future post on Vacation Home insurance policies and other issues specific to vacation properties? The standard homeowner policy states that if the house is unoccupied for extended periods, the policy can be nullified. I have done some research to show there is a difference between “unoccupied” and “vacant” properties. Typically, to maintain the standard homeowner policy the property must meet two criteria – 1) the house is in a condition such that a typical person could live there. This usually means the house is furnished and the utilities are turned on. 2) the house cannot be unoccupied for 30 or 60 days depending on the policy. Are there special vacation home policies and how do they compare to regular home insurance in regards to cost & coverage? Second, are there issues with having a vacation house in one state and your primary residence in another state? I’m thinking specifically of things like dealing with the post office or picking up packages addressed to a vacation home; things that require you to show an ID which doesn’t have the same address as your vacation home. We are closing Friday on a vacation home in Sleeping Bear Dunes Michigan. It feels strange buying a second home that is more valuable than our primary. However, my in-laws are paying the down-payment in full with the agreement they get to use it occasionally in their retirement. It will be rented during peak summer season which will hopefully pretty much cover costs. Hopefully my wife and I can enjoy it in the years to come and it will grow our net worth! Very good post Sam. We would be an interesting case study to review. We bought our first 2nd property when it would have been perhaps 1/3 of our net worth and now we have a much more expensive (think $1M) property as part of a total net worth approaching amount $9M (mostly net of tax). When we purchased the first one it was a major lifestyle decision and non trivial in terms of impact on us financially and emotionally. It presented no challenge, as it turned out, in terms of financial progress. it wasn’t too expensive, we could handle it ok. It was a big positive family impact but also required discipline and a level of commitment. Usage levels were very high – in the order of 25-30 weekends a year. We made a real go of it and I think made the most of it at the time with a young family. Over time, other assets and wealth accumulated. The 2nd property, which came along after about 10 years of owning the first one, is much more extensive and everyone is much more relaxed about it. It turns out we are using it a lot more than we even did the first one. We feel it is even more a part of our lives and justified as a slow-moving, solid asset growing at about inflation, that is running somewhat counter-cyclic with our other financial and city-home assets. I would never pursue a property that could not have a very high level of personal usage and preferably be driven to in 2 hours for practicality, security, usage and maintenance reasons. As a former owner of rental property as well, I would not engage this option. No one but my family and guests uses my place! That’s what financial freedom really buys. Sam-If it is below 8% of your current networth and u are saying that it is worth the same price u bought it for ($700K) let me congratulate you on becoming a decamillionaire! I think your math is off. But I do finally feel rich after five years of unemployment and now finding a job as an assistant high school tennis coach! WHOO HOO! You are right :). I assumed that you paid all cash and 100% equity. Even if you have 50% equity you are still a pentamillionaire :). Sorry to have cut your estimated networth in half. No problem. You can cut the estimate in half again just to be safe! But going back to your original assumption, $700,000 / 8% does not equal $10,000,000. I think we’ve taken a different approach to this. We live in Michigan where seemingly everyone owns a cottage “up north” or on one of the Great Lakes. Rather than having a vacation home where we have to travel for hours just to reach it, we splurged on a lakefront home on one of the Michigan inland lakes. Realistically, it was considerably more expensive than buying a similar home not on a lake and a separate cottage. However, we get year-round enjoyment from it just by going in our backyard (water skiing, tubing and swimming in the summer and ice skating and fishing in the winter). It’s like being on vacation every day. No plans to purchase a vacation home yet. I’m still in the process of considering a single family home first. Maybe after I get that down, I’ll start considering a vacation home and the possibilities of using it as a rental property or even as an AirBnB. On another note, Tahoe is really beautiful when it’s snowing. I’ve went there a few times and the cabins that I stayed in were really spacious and nice. 1. Show this post to my wife. Similar question to Mister S…can you rent out your vacation property on AirBNB? I was looking into doing something like that but it does seem like a lot of work. However, there seems to be a lot management services which will take care of a lot of the details. My wife and I were very close to buying a vacation property in Hawaii. We are both early retired(retired in our 30’s) but found we wanted more variety then a single home. After doing a lot of research we went with equity ownership in a luxury residence fund. There is a lot of them but we went with a company called Equity Estates. We liked their locations(over 60) We also liked that we have equity ownership and the fund forces liquidation after 10 years. After which time you can take the money out or re-invest in the current newly created fund offering. They are also the most transparent fund we found when doing our research. Yearly audited financials, strong balance sheet(They don’t over extend buying property on credit). The returns they told us to expect are reasonable 3% to 5% for IRR. It may be better but don’t expect it. We are coming up on our 2nd anniversary and so far love the variety and service. We may not get the return out of owning a single vacation property but we bought in for the variety of luxury residences and experience. I’ll check out Equity Estates. How much does it cost and how many nights have you bought? Yes we looked at Exclusive Resorts but there was no equity ownership at that time, just rental. It wasn’t right for us as we wanted to get a small return on our money. For Equity Estates we bought 15 nights a year(You can get 30 or 45 as well) for a one time payment of 207K. Then we pay 10k a year in annual dues, but that’s it, nothing else for the nights. The residences are only rented to owners so we have never experienced an issue getting the dates we wanted. For peak times like Christmas, New Years, etc everyone is put in a lottery and winners are chosen that way. We love it and the locations are great. We have stayed in Bahamas, Cabo, Hilton Head, New York, Chicago and are staying in Napa and Tahoe this summer. A great way to compare these different luxury rental companies is the Sherpa Report. That’s what we used initially. Ah, very interesting! With the equity component, does that mean you have a chance of re-coup your $207,000 if you decide to no longer be a part of Equity Estates? How about the chance to make money from the initial capital injection? That sounds much better than Exclusive Resorts! Although the properties in ER’s portfolio are pretty sick. That’s a lot of snow! My college roommate lives in Tahoe with his family. He’s having a great time up there. Good advice about vacation property. We are planning to move into our rental home in the next few years and we don’t know what to do about our current home. I guess we could rent it out, but it’d be only worth it if we plan to move back here at some point. We really love this place and it’s in an awesome location so it is going to be hard to let go. If we look at it as a vacation property instead, that might be the key to changing our mindset. We can vacation here when the weather is nice and rent it out when we’re not in town. It’s less than 10% of our net worth. You are right that most people under estimate how much time they will spend in a vacation property. After all, you can only sleep in one bed no matter how wealthy you are! Vacation properties are only advisable for those who are financially independent otherwise use your time to see different places in the world and just rent! I’ve actually got a guest post on Airbnb coming up. Stay tuned. I recommend NOT buying a condo in SF to rent out on Airbnb b/c of restrictions to how many days you can rent out. There are fines after a certain amount of days. Further, your condo association will probably NOT allow you to rent out your condo in short-term rentals either due to noise, liability, turnover, damage to common areas, etc. Condo prices are FALLING right now due to massive supply. This supply will take at least a couple years to work it’s way through. For a condo, I’d look to buy in winter of 2018/2019 or maybe farther. For a single family home under $1.5M, it is HOT HOT HOT right now. Those pictures are awesome and I really like the way you frame the perspective of looking at a vacation property as an investment in lifestyle rather than a financial investment. Framed this way, the return would be hard to beat. We don’t currently have any vacation property plans, or even the ability to purchase one, but with two young kids, we dream about a vacation property in the nearby mountains. I like the idea of having the property within an hour or so of our primary residence so we could use it every weekend if we wanted. Our current target location is Lake Arrowhead, CA. I foresee a vacation home in my future. My wife and I are talking about having kids soon and I love the idea of taking the kids to the vacation home multiple times a year and eventually pass it down to them. Sam, you make a very good point on vacation properties. We were in Beaver Creek, Colorado last summer and I thought about how nice it would be to have a vacation property out there. Golf and hiking in the summer and skiing in the winter. But the reality is we would likely only use it for 1 maybe 2 weeks a year. We have far too many places left on our travel list to check off. So for now, we’ll just be renting a place next time we go back. Being a relatively new parent myself, I’m more interested in the future than in vacation rentals. The vision of a future self able to relax and spend time with family, and family being able to enjoy the fruits of my labor, is attractive. But I’m terrified of the potential impact on my boys growing up feeling entitled and without the drive to hustle and work hard which I had to use to thrive. Sam – I’ve enjoyed your past thoughts on work ethic and hustle. Would love to see more in the future on how you plan to keep your financial success from stunting your children’s work ethic. Absolutely. I’ve got a number of posts in the pipeline regarding thoughts on raising responsible kids. Just give me some time to have them kids in the first place. The topics are going to be insightful, real, and very entertaining! I look forward to everybody in the community pitching in. Can’t wait for these posts! Get busy (no pun intended) on having them kids so we can read them. It has. Spending no more than 1/10 of your net worth on a vacation property allows one to easily pay for all expenses associated with the ownership of the property. I’ve been very meticulous in observing how I felt when I first bought, when the financial crisis was happening, and after the recovery when my net worth started to rebound. Once the value of the property went below 10% my net worth, there has been such a little stress regarding its value and liability to my finances. I’m providing a real time, real world, first-hand experience here. All anybody has to do is ask someone who’s been there before how it was like and consider their viewpoint before going ahead. Interesting, and very timely topic for me personally. As I have relocated to a more urban part of the country, I am considering a vacation property back home. Starting my own family, I know it will feel a bit crowded at my parents’ house when the entire family is gathering there. 10% of net worth will probably be a stretch for me, but your advice is definitely something I’ll take into consideration when I make my calculations. I don’t have a vacation home, but I have friends who do. I highly recommend this setup. I basically use it as much as they do but I have none of the hassle, and it has been quite a bit of hassle for them. They had hassles with remodeling, hassles with neighbors, hassles due to the drought, and hassles when they tried to sell it. Luckily, they decided to keep it and we will be able to use it a lot more soon. We will probably be getting a vacation home of sorts soon in the form of a used truck camper, but I plan to spend less than $5000 on it, so it’s kind of in a different league. Having people hook you up is a great arrangement. I just feel really bad using anything from anybody if I don’t give something back in return. My motto has always been to give first and never ask for anything. Maybe it’s a cultural thing. But I feel really guilty asking. Do you have any tips on how to ask your friends to lend them their vacation property, knowing they have the hassle and expenses to deal with? Is there a financial exchange, baby sitting, help with a business you offer or something? Or perhaps only ask after a certain level of friendship etc? I have a post on this coming up sometime. It helps that the vacation home belongs to the family of my best friend since 5th grade and I’ve helped them with projects on it for most of that time, so I don’t really feel bad. We are practically family. When I get favors from people I’m not quite so close to I try to minimize my impact or offer something in exchange. For example, when I borrowed a buddy’s truck I returned it with more gas than when I borrowed it. If I was using someone’s vacation home I would make sure it was spotless when I left and probably fix something while I was there. I might even leave a little thank you gift. The best advice is to send a physical Thank You note. It’s rarely done these days, and people love getting them. I think you have written about how much the notes you get mean to you. Ah, very cool. Every a best friend with a nice vacation property really is a great thing! Funny thing is that my friend who let us stay 7 nights in Paris has a son that is waiting for admissions into the very high school I’m coaching at. So of course I let him know that I would put in a kind word for his son, whom I know, and already wrote a letter of recommendation for at my club. Can’t hurt to be nice! I think it’s interesting the thoughts of the ex-lawyer: an asset which makes up so little of a person’s net worth probably isn’t worth selling and going through the hassle of dealing with others. In addition, there are probably ways to pass assets (through a trust or something) to your kids. Someday I would like to purchase a vacation home. I’m not sure yet though where or for what purpose. I’d like to get married first before I make any decisions for personal pleasure like vacation homes! Do you think you’d ever buy another vacation home? One of the goals I’ve had for never feeling homesick is to buy a vacation property in every place you love to vacation! That way, you’ll always have your stuff in the chest of drawers or in the closet to pull from. Of course, that takes a lot of money, but it can be done! This is how I’ve basically engineered my lifestyle today. And I think this is why I’m also such a fan of property because they have provide so many awesome EXPERIENCES that a stock would never provide. Given I can’t be more than one place at once, and can’t travel too quickly, I think three properties in three different locations is my max. Besides, I don’t want to pay more property taxes and deal with maintenance in the 2nd half of my life anymore, hence my push into real estate crowdfunding as an investment. It’s true – your vacation condo will become invaluable when you have kid(s) to ski with. I live in a town similar to Tahoe and there’s really nothing better …. My 5-year-old has been in a weekly program since he was 3, and he can now ski the entire mountain and keep up (as can all the other kids who started at the same age). It’s the best, and mountain biking or wake boarding in the summer isn’t too bad either. I view the skiing stuff as the best money I spend. Ultimately what keeps scaring me off from a vacation home is how much I hate doing maintenance work around my existing house. If I had a vacation home it just seems like more work. This is even before you talk about costs. I’d be less worried about costs as knowing me I’d probably AirBnB the sucker at least up till my mortgage payment each month or I wouldn’t buy in the first place. Honestly when we get to be around retirement we may buy a vacation home, but the goal will be to retire to that place and sell our primary when the time comes. I assume knowing me that I could down size to the type of vacation home I would want and save a good chunk. I’m not anywhere near that time. Maintenance is what kept me away from buying a vacation house in Tahoe. This is why I bought a condo at The Resort. For a large monthly fee, I don’t have to do any maintenance. They literally do everything, and having the restaurants, pools, hot tubs, gyms, spa, and ski-in/ski-out plus golf course and lake right on the property is awesome. Topic for another post! What type of vacation property to buy. 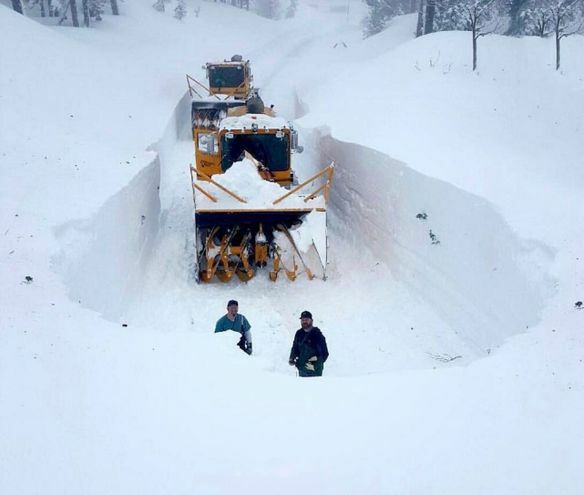 That picture of a road buried in 23 feet of snow is awesome. I don’t own a vacation property and I don’t plan on buying one. The world seems to too large with too much of it that I haven’t seen. I can’t imagine going back to the same place over and over instead of exploring something new. If I did ever change my mind about this, your 10% guideline seems reasonable. That’s where working people screw up their calculation of vacation property usage. They forget they want to see other parts of the world and only have 4-6 weeks maximum a year, usually to do so! Being unemployed has allowed me to use my property 30 – 60 days a year for the past five years and travel international about 20 – 30 days a year as well. Although it can be sad to not have a job, it feels amazing to live free and enjoy life on your terms while staying connected with folks due to the internet. No plans to buy a vacation property. My wife and I just aren’t dedicated to a single location to consider investing in it. Growing up, I spent almost a weekend a month out in Lake Havasu, Arizona. My father definitely should have bought property out there. Since his passing, the family has never really returned there. My wife and I have been to several Hilton timeshare sales pitches. We listen carefully, ask tons of questions, and burn 2-3 hours each time. The numbers never add up right for us. On the upside, we’ve had a cruise and four weekend vacation stays (Napa, Orlando, Las Vegas, New York) paid for as credit four our attendance. Having seen the numbers multiple times I would still back buying the real property over Hilton, but I appreciate the free stays in exchange for our honest evaluation time! The numbers add up a lot better if, after those presentations, you take a look at what’s available on the secondary market. That would be people who bought into those high pressure sales, and then years later decide they don’t want to pay the maintenance fees anymore. They just want to unload them for pennies on the dollar (although most just forfeit the packages back instead of selling). You can pick up timeshares for, no joke, 1/20th the cost of what they push in the presentations! Oooh, genius point, Mike! Thanks. It was hard for them to beat my wife’s active duty ability to get us on a military chartered flight (free if there is space available) and stay on any base in the world for about $45 a night. Preferably Air Force bases, ’cause Marines live like savages ;). With sites like airbnb, homeaway, etc for a vacation in nice places in homes for the whole family in one spot or buy a second home with a dirty cheap mortgage combined with property management companies that rents your place out when you aren’t there to cover the carry-cost, I don’t know why anyone would ever buy a timeshare when you could at any moment end up with a massive assessment cost, re-sell value is horrible, implied interest rate is usually 10-12%, etc. But as you mentioned, it’s sometimes worth listening to the pitch to get freebies – but the reason they can give you freebies is those things have fat margins.